Kat's Retirement Journey: Tasty Tuesday and a Winner! Hello and Happy Tuesday to you! I LOVE Tasty Tuesday because I enjoy cooking and sharing recipes! Wait till you see today's recipe...my, oh my!!! But, first things first! The winner of last week's drawing (see post HERE)...drum roll please...is Margarita! Margarita, I will be sending the card set out to you this week:) I truly hope you like them! This beet was 3 1/2 pounds!!! One beet was a meal! 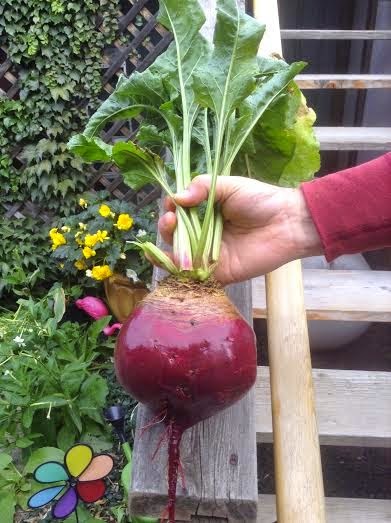 You might think that a beet this big couldn't possibly taste good but it was amazing! So sweet and tender. Our beets and carrots are gigantic this year! Hubby says it has to do with Ironite and Compost! Guess he knows what he's talking about:) He likes to garden as much as I like to cook! Last week I wanted to make zucchini bread for potluck so I Googled "best zucchini bread recipe" and saw this one for Paula Deen's Chocolate Chip Zucchini Bread! I hope you like it as much as we do! 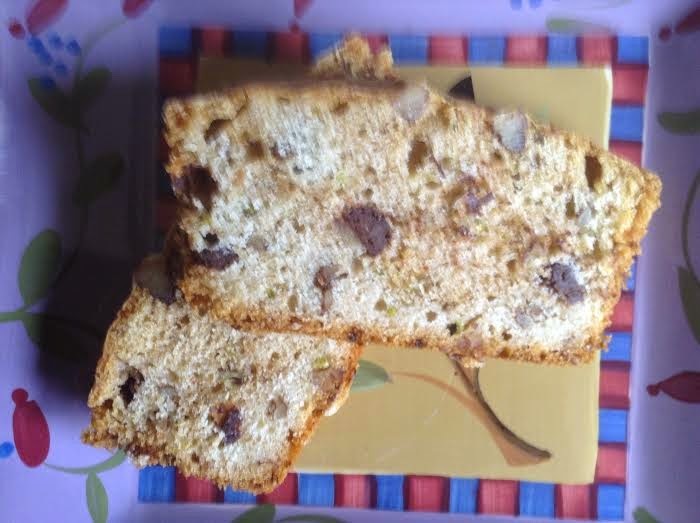 The zucchini bread looks a little dry in the picture but it was so moist and yummy! In a large bowl, beat eggs until light and fluffy. Add sugar and continue beating until well blended. Stir in oil, vanilla, zucchini, pecans, chocolate chips and orange zest. Stir in sifted ingredients. Pour into prepared loaf pans. Bake for 50 minutes (mine took 60 minutes), or until a skewer inserted in the middle comes out clean. Remove loaves from pans and cool. Chill before slicing. Serve with whipped cream and ribbons of zucchini. I plan to work this recipe over a little to make it vegan and use less oil so will keep you posted on my redux! You've got that right! I could hardly believe it!!! Hooray!! Thank you! I do love your cards and can wait to display one on my "wall of fame"! That Zucchini bread looks yum-o! I'm on a pumpkin bread kick myself these days! So glad you like my cards (yours are pretty awesome, btw). Yes, the Chocolate Chip Zucchini bread was totally yummy. Have you tried chocolate chips in your pumpkin bread?